At CES this week, Cisco is demonstrating for its global service provider customers innovation and use cases for cloud-powered, app-driven video services, ranging from cloud DVR to OTT video and mobile-friendly experiences. Service providers today are virtualizing their network infrastructure and applications, using multiple clouds – or a ‘hybrid cloud’ approach, including their own private cloud, and public clouds to simplify operations and speed time to market for new experiences and services. 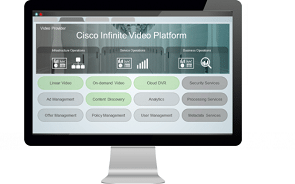 With the Cisco® Infinite Video Platform, service providers can utilize a virtual cloud stack to deliver best-in-class, highly secured video experiences to all consumer devices from one platform. As the popularity of OTT streaming video continues to rise, service providers are increasingly focused on providing advanced services such as cloud DVR, enabling consumers to stream their video recordings from the cloud to any device over any Internet connection with the touch of an app. More than 20 global service providers are already delivering and/or involved in public and private beta testing programs for cloud DVR services with Cisco, realizing benefits including the ability to implement private or public cloud deployments that offer CapEx and OpEx savings as well as increased agility and time to market. Cisco Infinite Video Platform and cloud DVR services currently support more than 20 million subscribers worldwide. Cisco is leading the disruption in the industry with our technology innovations in systems, silicon, optics and security, and our unrivaled expertise in mass-scale networking, automation, optical, cable access, video, and mobility. Together with our portfolio of professional services, we can enable service providers and media and web companies to reduce cost and complexity, help secure their networks and grow revenue.